If you're not half asleep when you begin listening to Still Life, you will be by disc's end. Recording as Amongst Myselves, Steve Roberts demonstrates his natural ability in spacemusic. Rather than coerce his synths, Roberts communes with them and composes soft labyrinthine soundscapes of well designed detail. The arrangement of Still Life obviously began somewhere outside of the music studio where Roberts carefully plotted the placement and delivery of each sound. Once inside, he used the studio as a compositional tool, realizing nine ambient tracks which will resonate within each of us differently. This is not an album that acts through repetition, not the edited highlights of an extended process. Still Life is a very personal conception, dutifully crafted and produced. The intricate windings are contoured with the unpredictability of a dream, making the album contemplative, yet bewildering. This music is an immersive experience and locates the listener in a different space from where they began. 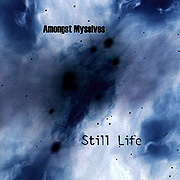 An album in the truest sense of the word, Still Life is a scrapbook of sounds containing a range of shapes and moods. A perfumed nightmare, an uninhabited theme, the cool of blue - with each listen this album adds another shade to the emotional palette. Due to its indistinction of form, the album must be described in relation to its tension and release - compression and expansion. When compared to a gallery walk, this album becomes a collection of sonic vignettes ranging from the serene to the brash, the muddled to the crystalline, from calm to stormy and ultimately more interesting with each visit. This Still Life is one created in impressionistic style, the true sonic representation of something remembered.